ChiZine Magazine is sponsoring a fabulous one day event at Hart House in Toronto on October 23 featuring a stunning lineup of 11 speculative fiction authors including Kelley Armstrong, Guy Gavriel Kaye, Peter Watts, Karl Schroeder, Julie Czerneda, Tony Burgess, David Nickles, Gemma Files, Claude Lalumiere, Micahel Rowe and Robert Boyczuk. The full details are in the press release below or you can visit their website. Register now because seating is limited. For those considering attending, I have included the Program Schedule at the end of the post which includes both lectures and readings. TORONTO, ON (September 7, 2010) – On October 23, 2010 authors, editors and readers will gather to explore the state of speculative fiction in Canada at Toronto’s SpecFic Colloquium. 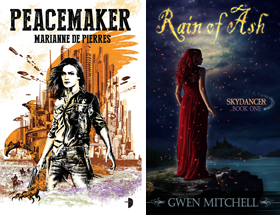 The colloquium, a one-day event to launch the Chiaroscuro Reading Series, will deliver lectures by major names in the field on topics including urban fantasy, cognitive science, queering the genre, and the spread of Canadian science fiction. The lectures will be followed by readings that showcase emergent and experienced Canadian speculative fiction writers. Guests include Kelley Armstrong, Julie Czerneda, Guy Gavriel Kay, Tony Burgess, Gemma Files, Karl Schroeder, Peter Watts, David Nickle, Bob Boyczuk, Michael Rowe and Claude Lalumière. 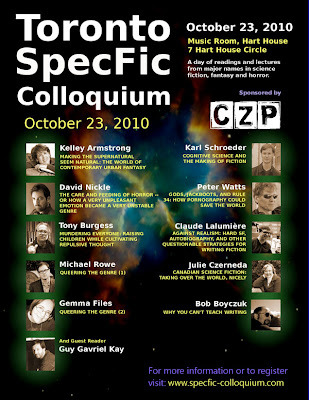 Sponsored by ChiZine Publications, an independent publisher of weird, surreal, subtle, and disturbing dark literary fiction, the Toronto SpecFic Colloquium will take place on Saturday October 23, 2010 in the Music Room,Hart House, 7 Hart House Circle. Register at http://www.specfic-colloquium.com/registration.htm. 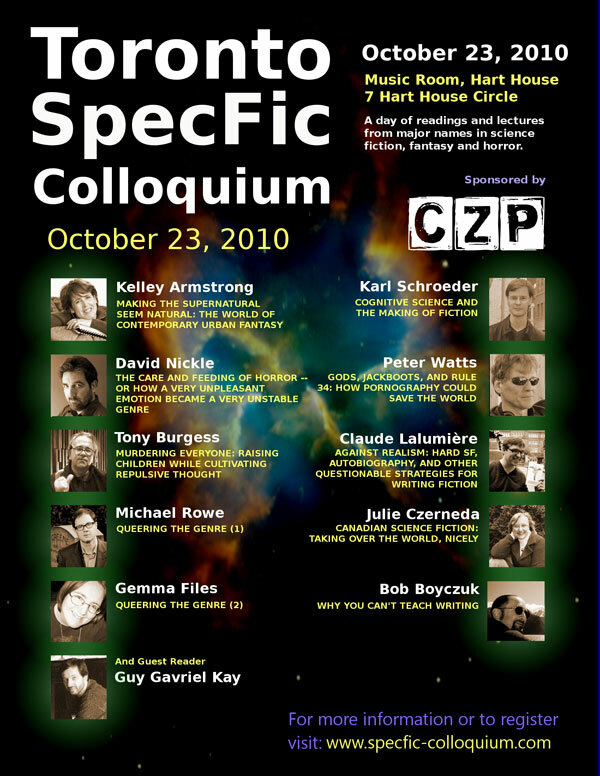 For further information about the Toronto SpecFic Colloquium, visit http://specfic-colloquium.com. For sponsorship partnering, advertizing opportunities or media queries, contact Sandra Kasturi, co-organizer at sandra@chizinepub.com or Helen Marshall, co-organizer at helen@chizinepub.com. I am green with envy, every inch even my toes are green! This sound like a great worthy collaboration of Sifi-ness at it's very best with The Best of the Best and I am sure it will be a success. This is yet another reason why I should move to Ontario...this looks like such a blast! We'll be aiming to put the lectures online so check back at the site after the event for news about this!